Vinyl fences and vinyl shade structures are great additions to virtually any home. They add value and provide durable and functional appeal to any outdoor space. However, if you’re thinking of installing a new vinyl fence or vinyl shade structure, you’ll need to plan out and prepare the site you want to put it on, and that includes making sure the site is level. Leveling ground for a vinyl fence or shade structure can be tricky, which is why we’ve put together this short guide on how to do it yourself. Of course you can always hire an outside contractor (or let us at Future Outdoors do it for you when we install your new fence), but many homeowners prefer the satisfaction and savings of doing it their own way. If that sounds like you, keep reading. The first step to leveling any piece of ground is to mark out the area that needs to be leveled. If you’re planning to install a fence, this will probably be at or near your property line, so you might want to have someone from your township come and mark your property’s limits to be safe. In the case of a vinyl shade structure, you’ll simply need to mark out the approximate area you’re installing your new structure upon. The best way to mark and level ground quickly is with a string level. Drive stakes into the ground that are about a foot tall, and attach a string to the stakes a few inches above the ground. Then, level the string between each stake to find the high and low points in your yard. Most of the time it’s easiest to bring the ground up to the highest point, though in some cases you may find it easier to remove ground instead. Once your strings are level between posts, measure the height from the ground level to the string on the post. The difference between the heights on each post will be the amount of earth you’ll have to add (or remove) to make your yard level. Once you know approximately how much ground you’ll have to move, break out your shovel and work gloves. You might be tempted to use heavy machinery like an excavator or heavy grader, but fight that urge. Most of the time heavy equipment just results in too much ground getting taken out, and that means you’ll have to backfill it later on. Since backfilled ground has more air and moisture in it than most topsoil, it will settle differently and result in an unlevel site. Use your shovel to remove the grass in your work area, as well as any dirt above the level you need to achieve. Then, start adding in your soil mix to bring the rest of your site up to the proper height. Depending on your ground and whether you want grass to grow back you may use a mix of soil, sand, and compost to level the site. After you’ve added the proper amount of soil mix, you’ll need to tamp it down to ensure the ground is level and it doesn’t settle too much. There are different ways to tamp the ground depending on your project. For a vinyl fence, the best way to tamp is either with a tamping tool or the flat side of a soil rake. The narrow area you’ll need to level makes it better to use a small hand tool for the sake of convenience and speed. If you’re leveling a site for a vinyl shade structure, you may want to consider a lawn roller or a plate compactor to do the work faster. Since you’ll be working over a considerable area, these tools make the work much quicker than trying to do it all by hand. Remember to check your levels after tamping and add or remove any soil necessary. Proper tamping could change the level of the soil significantly, so always get your level out and ensure you didn’t make your site unlevel again by tamping it too much. Once you’ve tamped the ground, you need to let it settle for at least a few days to ensure it’s going to stay leveled. The longer you can let the ground settle after tamping, the better. You should also periodically (every few days or so) mist the ground with water to help the settling process, especially if you haven’t gotten any rain. After the ground has settled, it’s time to install your new vinyl fence or shade structure. Most of the time contractors will handle this step for you, but you can be certain they’ll appreciate having a properly leveled site to work on! Want to get the best deals on a vinyl fence or vinyl shade structure in the Dallas metro? Contact Future Outdoors today! We’re the leaders in the vinyl fence industry in Dallas-Fort Worth with hundreds of miles of fence installed around the metro area. Take a look at all of our different vinyl fencing and shade products on our website. 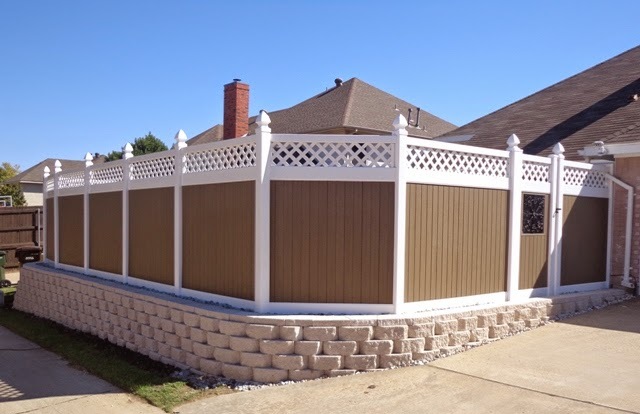 Call us today at (972) 576-1600 or visit our Facebook or Google+ pages to learn more about our vinyl fencing products!